These are very hard to find, and available in only limited quantities. The perfect sash for an Assuit dress or an authentic Egyptian folkloric accent for a tribal costume. Assuit is a mesh fabric with metal pieces pounded into it to make interesting patterns. Trimmed with coin and deco-bead crochet. Each one is a little different. Available in black only. This elegant triangular scarf is hand made in <?xml:namespace prefix = st1 ns = "urn:schemas-microsoft-com:office:smarttags" />Egypt and crocheted in a floral motif with glass beads worked throughout the scarf. Wear it in class or with a costume on stage. It can also be worn for mundane fashion and is a great shoulder wrap/shawl. Because this item is very labor intensive to make --- it is available in limited quantities. Regular price $70. Multiple rows of coin, round deco bead and deco teardrop-shaped beads crocheted in V patterns across the body of the hip sash and around the edge. This is an ample size hip sash that will work best for hips 38"- 46". Many solid and Monet-look multi-colors available. Stock changes daily, so contact us the day you would like to order and we will let you know what is in stock that day. 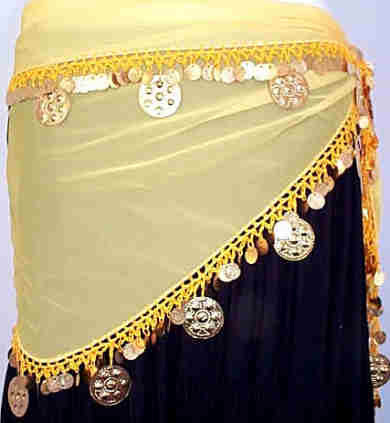 Crochet decor around the perimeter of the sash in the standard "Hanan Style"-Strands of round and tear drop shaped deco beads with coins at bottom edge-approx 2" deep. Makes a joyful noise. Double rows of coins on an ample size triangle. Can be tied in front or on side. Great for class or Folkloric / ATS / Gypsy dance or Renaissance Festival wear. Please state color choices 1, 2, 3 and coin color choice (gold or silver). Mustapha multi row chiffon triangular hip sashes are colorful, lots of fun and really unique. The decor is a combination of glass beads, colorful multi color deco beads and coins. The multicolor deco beads make this a great scarf for a folkloric, gypsy or ATS costume ... or just to wear to class to cheer yourself up!! Limited availability. This single-row coin triangle features dime-size and silver dollar size coins around the perimeter. The combination of coin sizes gives this sash a distinctive jingle when it moves. Everyone's favorite first hip sash! Makes a great folkloric head scarf too.